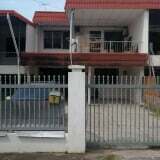 Taman Century Double Storey intermediate terrace for sell. Located in Hilltop right opposite of Prim. Taman Cerah is located at Jalan Tuaran By-Pass, Menggatal. This is a landed double story terrace hou. Double Storey Intermediate Terrace House in Taman Sutera Jaya (previously known as Taman Rose Jaya I.
Taman Indah Permai is located Sepanggar. Taman Indah Permai is surrounded by many College and Univer. Terrace single storey end corner Location near to cks supermarket, pick and pay mini market, Hing pa.